...why else would I drink beer? I rarely drink beer. I don't much like beer. Do I? I prefer Champagne. Wine. Spirits. But there is something about being on vacation that makes me want to drink beer. Not all of the time, but some of the time. When the temperature is 30c, snorkelling on beautiful reefs where startling fish dart in and out of pretty corals is thirsty work. You need something refreshing, something tall and cold to quench that thirst whilst you are, perhaps, patiently waiting for the world's best Cocktail to be carefully assembled. This is Fiji Bitter. You would probably never want to drink it anywhere else in the world. But in Fiji itself, Fiji Bitter sure hits the right spot. Being in Fiji makes everything good. You are peace with the world and and all of its mediocre beers. Memories can be stronger than the alcohol content: Strangely, I have a few crystal clear vacation beer memories, which is odd, as I have already explained I don't like beer. The best beer I think I ever experienced was an icy cold wheat beer, topped with a thick slice of citron a long, long time ago in Paris. That was a glass of beer I can honestly say I relished. And it's true what they say about Ireland too - the Guinness really does taste better there. I order it by the glass - as a pint is always too much for me. Back in the US we rented an appartment for a year in San Francisco which had a Guinness fridge and tap in the kitchen. I can tell you - it is quite something to have a small glass of Guinness before heading off to work. Guinness is good for you, I convinced myself as an excuse for my outrageous breakfast.
? Just high days, holidays (& breakfast), or all year round? What kind of a beer drinker are YOU ? Stout is the only beer I'll happily drink. It's chewy! But I can't imagine having it on tap in the kitchen; I'd end up having to roll the cost in with my utility bills: water, gas, electricity, Guinness ... Not that that would be a bad thing. Are you tempted to install a Guinness fridge where you live now? I don't drink beer very often but after a tennis match on a hot summers day a pint of Carlsberg slips down smoothly. Draught Budweiser shandy in New York on a humid Summers day is wonderful. I had a few in TGI Fridays and can taste it now......! I don't think anything or anyone can convince me to drink any sort of beer, I'll stick with my favourite tipple~and you know what that is! I agree with you, it sometimes depends on the locale. While I was in India last September, I enjoyed many tall Kingfishers, the local beer. When I came back to the states and ordered one in a local Indian restaurant, it just wasn't the same! Oddly, I like Japanese beer with Japanese food, especially grilled ones -- and ice cold beer with pizza is a hangover from college days, I guess. I remember lager in Scotland with pub snacks, the perfect match. Regularly? Not so much: maybe two or three times a year when the weather is hot. Drink beer every day! I work part-time at a little wine and beer shop, so it's hard to resist all those tasty brews! And, January is Stout Month...a reason to celebrate! Your own Guinness tap...impressive! I used to live next to the Guinness Brewery in Dublin and believe me, that was as close as I will ever be. The eau de brewing is not a fragrant aroma in the morning. enidd is a hot climate beer drinker. nothing like a bottle of singha on a malaysian beach. but in the winter, red wine please. Guinness fridge and tap in the kitchen??? Best SF apartment ever??? So many non-beer drinkers!? Who knew? A popular summer cooler at our pool shindigs is a ginger beer shandy. Half quality ale and half quality ginger beer - very cold. But mostly I just like a quiet, NOT-cold pint to sip slowly - something hand-pumped, not overly gassy, with a good balance of hop and malt. I think we have an oatmeal stout, TJ's vienna lager (a great darker lager - actually made by Gordon Biersch) and Full Sail Wassail available in the house. I also admit to liking Edison Light - an actual real light beer. I agree with Beccy on the Carlsberg and Owen with the shandy- very refreshing on warm days. But also beer at sports games, Guinness (or another deep, flavorful stout) with stew in the winter and a nice Belgian brew any time! Beer really is quite like wine in the sense that there are an amazing amount of different flavors that you can find. It's worth it, in my opinion, to play around a little and do a few tastings. You never know what you might find! Beer is definitely an afternoon beverage here; it sits better than in the evening, when it can be too heavy in copious amounts. I'm definitely a fan of Meantime in London (their IPA is fantastic, as is their Union, a Viennese amber ale), and Coopers, the Aussie microbrew (especially their Sparkling Ale, which you may like as it replicates champagne flavors -- think a hoppy Bollinger, if that makes sense). I'm definitely a fan of Fat Tire, Sierra Nevada, and the Anchor Steam beers, and Rogue out of Portland is also pretty spectacular. Clearly, I'm not being very helpful ;-). Well alright, my favorite beers are Asahi, Guinness, and Young's Double Chocolate Stout. Oh, wait, there is Leinenkugels from Wisconsin and Belgian tripels...yum! Beer-YUCK. I can imagine Fiji would make mud taste good, though. Hubby would totally agree that Guinness is good for you. Forget the beer ... your photos are always great! Love them! I love beer and drink it year round, although I admit I'm very particular these days: I really only like big, hoppy, preferably unfiltered IPAs, bitters and pale ales. The kind that make you pucker a little after your first sip. Mmmm. I do appreciate a cold lager on a hot day, though, and a good Guinness pour really is as good as a meal! 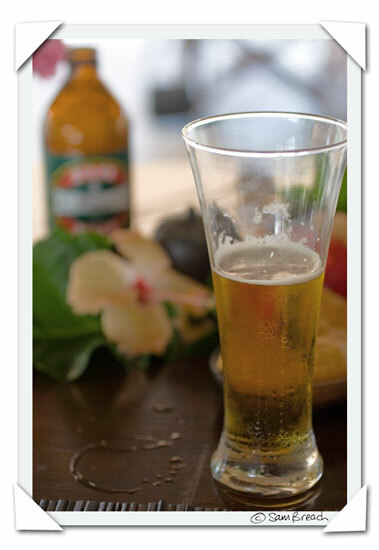 We went nuts for Presidente beer when we were in the Dominican Republic. So delish, especially on a hot beach. My taste for beer is entirely context-dependent. I'll drink any beer and love it during hockey playoffs. But that's the Canadian in me. I love beer, drink it all the time and even make it myself. IPA is my favorite. I have a confession...I used to love a beer after church....I sang in the choir and we would all go to dinner after...and the beer just seemed to sooth my throat. Sadly I have not had a beer since going gluten free (and loving it!). ...lager...and the "ladies" would drink it with 1/2 "lemonade" (shanty??).Yum. Whatever's local wherever I am . . . usually an amber type if that's an option. If I'm looking for something cozy, I'll lean towards a porter or a stout. If it's a hot summer day I'll go for a hefeweizen or IPA. But I live in wine country, so beer's a luxury! I agree, it's a must to try the local beer even if it's considered OK at home. It's a part of vacay, you can't sip a thick red wine on the beach! I've only recently become a beer drinker. I love it on a hot day and tend to mix it half and half with lemonade. Amstel would be my favourite, preferably consumed in Spain. I myself am a Fiji bitter when I can afford it and when I have enough money to travel home to Fiji just for a box of fiji bitters to share amongst family and friends while watching the sunset on a random beach or at uncle's garage while listening to love songs. But when in California, my second home .. it has to be Corona with lime.